It's easy to make a card so much more eye catching with just a couple of simple card making ideas. Ever thought that landscape card, while beautiful, looks like just another.....landscape? We can change that very easily. 1. This beach grass pops when I dab some Scribbles Iridescent Gold onto the fluffy tops. 2. 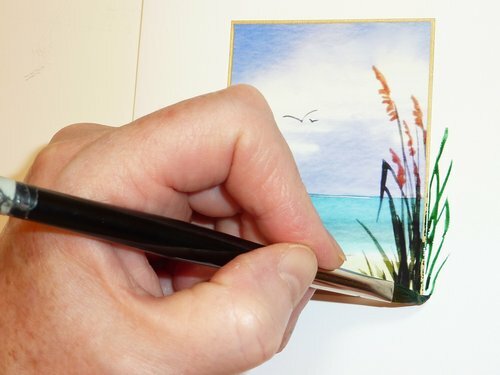 To further enhance the card, I paint with watercolor some grass stems outside the frame onto the card stock. 3. 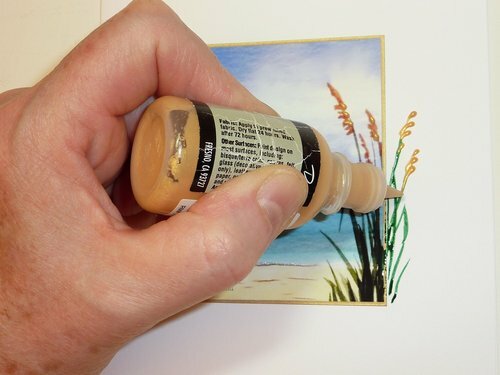 When the paint is dry, the gold paint is applied in 3 or 4 falling steps to suggest the fluffy grass. 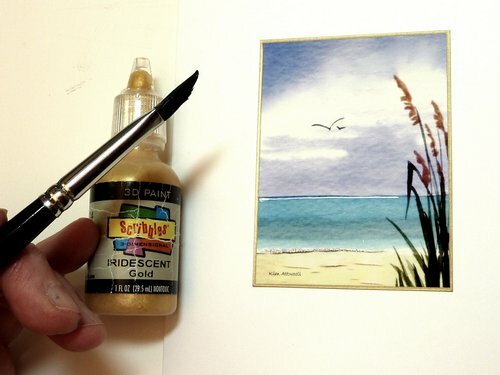 Often a landscape is of a distant view and this can give you the opportunity to paint in tall grasses in the foreground using either the watercolor or gold paint, or both as we just did.